Calcutta High Court Recruitment 2019 Notification for 200 Lower Division Assistant Posts is announced by the officials of the Calcutta High Court. All the interested people, from the West Bengal State, who are searching for the Government Jobs, can use this wonderful chance. As per the information in the Notification, candidates have to submit their application form on or before 19th January 2019. After that, no applications will be accepted by the officials. Now, remember at the time of applying for the Calcutta High Court Lower Division Assistant Recruitment 2019, candidates need to have the correct age. If not all such applications will be rejected. Have you completed your Higher Secondary Education from any Recognized Institute or University in India? And in search for the Government jobs? Well, then you should check about the Calcutta High Court Recruitment 2019. Through this advertisement, the officials gave total details about the Lower Division Assistant, for which they are accepting the applications from the interested and eligible contenders. Now, if in case, you are not eligible, or if you willing to check more other Government Jobs, check them on our site Freshers Now. Officials are looking for the candidates who completed their Higher Secondary Education from any recognized institute or University in India as the Educational Qualification. Now, the applicants can have a minimum age of 18 years. And the Maximum age should be around 40 years. The Age relaxation will change for all the Categories, check notification. Rs.5,400 to Rs.25,200/- Per Month is the salary the selected candidates will get. Over there you will find the Notification for the Lower Division Assistant. Recheck details and submit it before the final date. 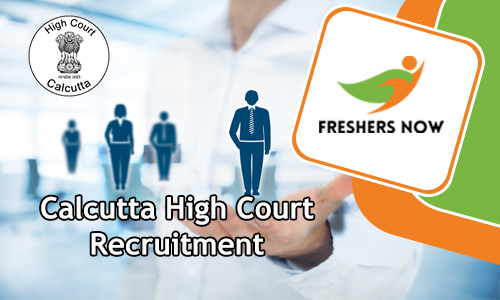 We shared the complete details about the Calcutta High Court Recruitment 2019. Hope it helped all the job searchers in the West Bengal. Calcutta High Court Officials released Calcutta High Court Recruitment 2018 Notification. And through that notification, the officials confirmed the availability of 50 English Stenographer(Group-B), Bengali Stenographer (Group-b), Lower Division Clerk (Group-C), Process Server/Summon Bailiff (Group-D), Peon/ Farash/ Night Guard (Group-D) Vacancies. Now, if you are from West Bengal state, and want to get into the Law field, then this opportunity is for you. Utilize this chance of getting hired. Accordingly, the candidates who are interested can start applying for this Openings from 22nd November 2018. And the Final date to submit the filled application form is 15th December 2018. So, check all the details clearly. And then go on to apply for the Calcutta High Court Recruitment 2018 before the closing date. Age of the candidates should be between 18 years to 40 years. Check the official site of the Calcutta High Court at calcuttahighcourt.nic.in. There you will find the Group B, C, D Recruitment Notification. And then submit by the closing date. Please go on and check more other Latest Government job Notification details like Calcutta High Court Recruitment 2018 by exploring our site Freshers Now regularly. Calcutta High Court Recruitment 2018-2019 Notification is out on 21st February 2018. And is grabbing all the attention of the people looking for the Government Jobs in India, particularly, Government Jobs in West Bengal. Complete information about the Calcutta High Court Recruitment 2018 Group c, Calcutta High Court Recruitment 2018, Calcutta High Court Stenographer recruitment 2018, calcuttahighcourt.nic.in recruitment 2018 and much more. Now, according to the information in the official Recruitment Notification by the Kolkata High Court, there are around 42 Vacancies. And these are for the PA/ Stenographer, Grade C Positions. Therefore, the Officials of the Kolkata High Court has asked all the people who are interested in these positions, to check all the details and then proceed to submit the filled application form by the Last date. The Closing date for Calcutta High Court Recruitment 2018 is 20th March 2018. More details are available you check them. Now in the Calcutta High Court Recruitment 2018-2019 Notification, the Officials of the organization has mentioned that they are looking for the Application forms from the candidates who had finished their 12th Class or its equivalent, from any recognized institute or Board as the Educational Qualification. Therefore, all those people who had this Qualification and in a job search can check more requirements. And then they can proceed to submit the Calcutta High Court Recruitment 2018 Application Form before the deadline. Along with the Educational Requirements, the officials of the Kolkata High Court also asked the applicants to have the correct age. As per the information in the Official Advertisement, Minimum Age can be 18 years. While the Maximum Age as per the mention is 32 years. This is should be as of on th 1st January 2018. For Age Relaxation, check Notification or further. Now, please take a deep look at the above-given table. You all will know about the complete information related to the Calcutta High Court Recruitment 2018-2019 Notification. So, there is so much competition for the Government Jobs in West Bengal. Therefore, all the people who are in the Job search should utilize this chance of getting placed in a renowned organization like Calcutta High Court. Now another thing you all should be aware that, you need to have had all the qualifications and requirements mentions in the advertisement, correctly. If not the Calcutta High Court will not consider the Applications from the people. And many of the contenders are not able to find out the information correctly. Therefore, for the sake of such people, here we are presenting this article. And this contains all the details. Soon after the Calcutta High Court Recruitment 2018-2019 Notification is out, many of the job hunters are surfing the internet for the details. And yet many of them are not able to hold the correct details as well as the official advertisement. Now, this post contains both of them. You will get to know about all the information and requirements. As well as you can also download the Calcutta High Court Recruitment 2018-2019 Notification which we have linked at the bottom of this article. Now, all you have to do is check them. And then proceed to apply before the Final date. Also, the aspirants should also be aware of some details. This includes Application Fee, Selection Rounds, salary and Application submission process. According to the information in Calcutta High Court Recruitment 2018-2019 Notification, there will be some selection rounds. All the applicants who will submit the application form before the final date, have to attend them. Only the performance in those rounds will be considered. Therefore, all the contenders have to prepare for those rounds in order to get the job. Accordingly, all the people should go through the Shorthand test. And thereafter they have to Transcribe it into handwriting within 45 Minutes. The Merit in this test will be considered for the Final decision. Now, those people who will get selected will also get the salary. Accordingly, the Calcutta High Court is going to pay Rs.7,100 to Rs.37,600/- per month. Along with the Grade pay of Rs.3,600. Now, remember that to complete your application submission process, you all have to pay the application fee. Accordingly, the Calcutta High Court officials have mentioned that they will consider applications only if the contenders paid the application fee, before the deadline. So the candidates have to pay Rs.300 as the application fee. While the officials asked the SC and ST Candidates of the WB to pay only Rs.150. Remember to recheck the advertisement, before making the payment. And down in this post, we are going to give some details about this Notification in clear. You can check them all to get an overall idea. Also, at the end of this post, along with the PDF link of Calcutta High Court Recruitment 2018-2019 Notification, we are also giving some steps. With the help of those steps, you can apply for the Calcutta High Court Recruitment 2018-2019 easily and fastly. Should complete 12th Class as Education. And having Speed in Shorthand and Typewriting at 120 w.p.m. and 30 w.p.m. respectively is additional. Selected people will get Rs.7,100 to Rs.37,600 Per month. Along with that, they will also get Grade Pay of Rs.3,600. First of all, check the official site of the Calcutta High Court at calcuttahighcourt.nic.in. Find the Official Calcutta High Court Recruitment 2018-2019 Notification for 42 PA Stenographer Vacancies. Go through all the information and requirements. Hope we covered all the details of the Calcutta High Court Recruitment 2018-2019. For more such fine and detailed information about other recruitments, check our site Freshersnow.com often.